In March 2016 our Business Development Manager Tregarran & our Assistant Academic Director Emiliano visited Kiev to present at the 2nd annual FLT Forum hosted by one of our partner agencies. It was a wonderful event and a great chance for UKLC to showcase our teaching methods specifically designed to challenge young learners of all abilities. 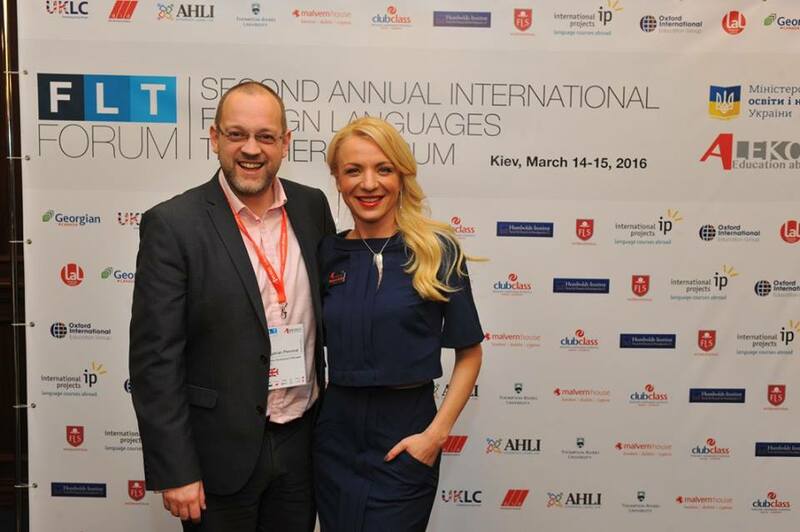 Tregarran & Emiliano were invited to the 2nd annual FLT Forum in Kiev to deliver informative seminars to over 100 foreign language teachers from all over Ukraine. The seminars were designed to explain the methods UKLC use to teach junior students across our eight international summer camps and to give the attending teachers some new refreshing ideas to use in their own classes. The event was a huge success and a great opportunity for Tregarran & Emiliano to speak face to face with potential group leaders and discover what they require from a summer language programme in the UK. Emiliano delivered a seminar titled “Experience Design” and “Teaching as Performing” – Methods to Engage Teenage Students. The seminar focused on the best ways to engage teenage students in a fun but educationally driven way. The seminar was warmly received and was voted the third best seminar at the event by the participating teachers! We would like to thank our partner agency for inviting us to the FLT Forum and delivering such a wonderful event which was enjoyed by all.